Featuring the standard GoPro three-prong interface, the SHILL Tripod Mount for GoPro allows you to mount a GoPro housing or frame on a tripod or other support device that has a 1/4"-20 threaded screw. 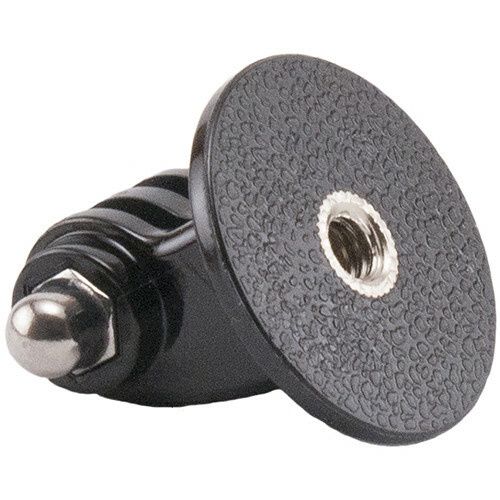 Box Dimensions (LxWxH) 3.4 x 3.0 x 0.6"
Tripod Mount for GoPro is rated 2.0 out of 5 by 1. Rated 2 out of 5 by Anonymous from Possible issues with this mount - read The mount screws on a standard tripod just fine, but it is made of hard plastic, so there is no way to tighten the screw for the GoPro mount, so you end up with a floppy mess that you have to secure some other way. A softer plastic would enable you to tighten the GoPro to the mount.